Stunning inner city cocoon with vibrant decor and wonderful views. 5 minutes to Hobart's restaurant and entertainment strip. Walk to CBD, waterfront and Salamanca Markets. 10 minute drive to Mona and only 20 minutes to historic Richmond. 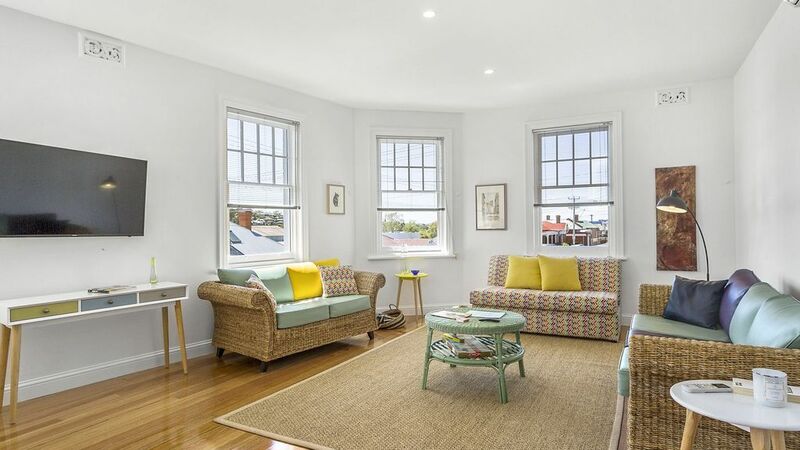 Modern first floor apartment within a beautifully restored North Hobart landmark building. Full kitchen and laundry, quality appliances, air-conditioning and double glazed feature windows. Free high speed internet for fast streaming on large screen smart TV. Every comfort and CCTV security. Bright and spacious two bedroom apartment with beautiful Tasmanian Oak floors throughout, stunning decor and every convenience. Wonderful sunny outlook with views to city, the Domain and Mount Wellington. The apartment can sleep up to six. The two bedrooms are large and each contain comfortable queen beds with high quality linen and doonas. There is a computer table in one bedroom. There are plenty of wardrobes and built-in storage throughout. A striking custom built sofa in the lounge can easily and quickly be opened into a comfortable double sized bed with a real spring mattress. The large bathroom features gorgeous Spanish tiles with an easy access walk-in shower and heating. You can see the Mountain while you shower. The built in laundry in the hallway includes a Bosch washing machine and a spin dryer along with soaking tub and small drying rack. The striking kitchen and dining areas have every modern convenience and the most amazing outlook from double glazed feature windows. Kitchen equipment includes every thing you need from oven, electric cook top, microwave and dishwasher to high quality cookware, cutlery and dining settings. Enjoy the morning sun with a coffee at the windows, dine in comfort with an evening meal or just stroll to the North Hobart precinct with its restaurants, cafes, hotels and the iconic State Cinema. The original windows have all been retained but with double glazing to turn the apartment into an inner city cocoon. The lounge room has two comfortable large couches in striking cane along with a colorful window sofa on which you can relax with a book or watch your favorite program on the high speed streaming smartTV. The wall mounted smartTV can be adjusted to view from the kitchen, dining or lounge room and you can access ABC iView, SBS On Demand and YouTube as well as local channels, or simply log into your own Netflix account and use our free high speed WiFi. You can play your own music library using the JBL Bluetooth enabled FM clock radio. The speaker also has USB connections so you can charge your own devices if you need. The apartment also has a large private outside deck area with undercover seating and dining. CCTV coverage of the entire property adds to your sense of comfort and security. There is plenty of local street parking and on-site car parking is available by request. The apartment is all yours. Self check-in with your own PIN code. Access is from the rear of the building via stairs to your private covered deck and entrance. Your hosts live nearby and can be easily contacted. We will respond immediately to any request for information or assistance but our approach is to respect your privacy. Our building dates back to the early 1900s and most recently served the local community as a general store. Don't be phased by any old or outdated photographs you might find online. We are proud to have saved and restored the main building by including two ground level studio apartments at the rear and the stunning two bedroom apartment above the original corner shop which will continue as a commercial business. The apartments are also ideally situated for business and professional visits with easy access to the CBD, major hospitals, sporting arenas and convention facilities. Contact the hosts for special rates for longer term business stays. Please NOTE: In addition to the upstairs apartment there are also two stylish one bedroom studio apartments on the the ground floor, each of which can sleep up to four guests. Details for the studios can be obtained from hosts. North Hobart is the City's entertainment precinct with theatres, hotels, cafes and restaurants. Once one of Hobart's more historic working class areas, North Hobart has become an inner city haven with easy access to everything that Hobart and Tasmania has to offer. Argyle Street is one of Hobart's major arterial roads easily connecting to Tasmania's highways for travel to popular destinations such as Richmond, Port Arthur, the Lakes district and East Coast. The Airport Shuttle stops within metres from the door, just ask the driver. The large and bright bathroom features stunning Spanish tiles, walk in shower and views of Mt Wellington. 2 bedroom luxury North Hobart haven with only 5 min walk to the City's entertainment precinct with theatres, hotels, cafes and restaurants. 30min walk to CBD and Salamanca. 10 minute drive to Mona. The striking kitchen and dining areas have every modern convenience and amazing outlook from double glazed feature windows. Play your own music library on the JBL Bluetooth enabled speaker and FM clock radio which also has USB ports to charge your own devices if you need. Nicely done renovation, both lovely and comfortable. Much thought has gone into providing anything a guest would need. Loved the convenient location. Beautifully decorated. Sparkling clean. Lots of space for a family. This apartment was beautifully renovated. Love the lounge and kitchen area. Plenty of space for a family to relax in. Close to the main restaurant strip and quick Uber ride to Salamanca. Would highly recommend. Very happy. Great apartment. Beautifully renovated. Close to everything. Enjoyed our time in the apartment. Felt like home. Would highly recommend a stay here. Nice, freshly renovated, parking unclear, water pressure in the shower low. It was a lovely apartment in a great location that was convenient to downtown. Modern, clean apartment with all the amenities. Close to great restaurants and coffee shops. Nice hosts who were always available to answer our questions quickly. The apartment and experience exceeded our expectations. We would definitely stay here again. North Hobart is the City's entertainment precinct with theatres, hotels, cafes and restaurants. Once one of Hobart's more historic working class areas, North Hobart has become an inner city hub with easy access that everything Hobart and Tasmania has to offer. kunanyi/Mount Wellington is thirty minutes to the top. Our building dates back to the early 1900s and most recently served the local community as a general store. Don't be phased by any old or outdated photographs you might find. We are proud to have saved and restored the main building by including two ground level studio apartments at the rear and the stunning two bedroom apartment above the original corner shop which will continue as a commercial business.